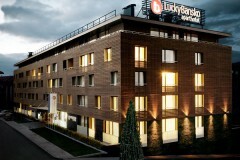 Aparthotel Lucky Bansko will enchant you with its luxurious interior, its comfortable furnishing, its appetizing cuisine, professional service, incredible views, attractive prices and the variety of amenities offered, as well as its great location. ACADEMIE is world known and established cosmetics of the highest class. The radiofrequency lifting is unconditional space technology for regeneration of the skin and recovering of it’s elasticity, with lifting effect, anti-aging and smoothing wrinkles.